Rocker arm ratio is determined by the relationship between the push rod cup, the rocker shaft centerline, and the roller tip. TD machines these critical dimensions to close tolerances to ensure accurate rocker arm ratios. 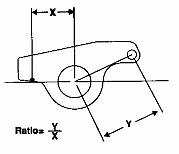 Discrepancies in rocker arm ratio will occur because the motion of the roller tip describes an arc, The valve stem axis is tangent to this arc. Because of this relationship some of the roller tip motion is directed across the valve stem instead of in a direct line along the stem axis. This can account for discrepancies in valve lift based on mechanical rocker arm ratios.